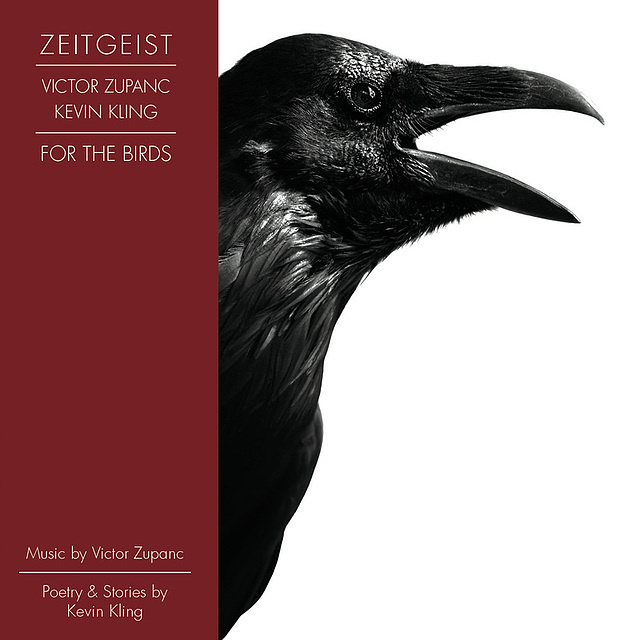 "For the Birds"-Performed by Zeitgeist, Victor Zupanc and Kevin Kling. Sponsored by the Northfield Arts Guild and Arts @ Carleton. Co-written in 2010 by Victor Zupanc and Kevin Kling, For the Birds is a concert length work that, on the surface, seems to be about birds. 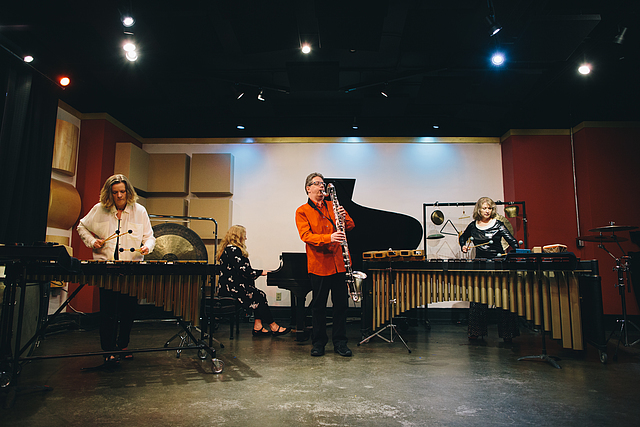 It features a series of musical pieces extolling the nature of each particular bird (sparrows, roosters, woodpeckers, Canadian geese, hawks), drawing parallels with our own human nature. Interspersed between, is insightful storytelling created by Kling reflecting on childhood memories, immigration, illness, accidents, and healing. However, just below the surface (but discernible to those that look), For the Birds is a work about that part of our human nature that compels us to reach beyond ourselves for more —more opportunity for our family, more money, more fun, more speed, more knowledge, more love. When all goes well, we call that need aspiration. When it doesn’t, and we plunge to the earth with melting wings, we call it hubris. Through utterly delightful music and a worldview only Kevin Kling can provide, For the Birds gives us the space to contemplate our nature, laugh at ourselves, and heal. 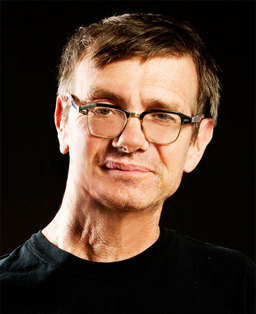 Kevin Kling is a well-known playwright and storyteller, best known for his popular commentaries on National Public Radio’s All Things Considered. His storytelling stage shows like Tales from the Charred Underbelly of the Yule Log, deliver hilarious, often tender stories. Kling’s autobiographical tales are as enchanting as they are true to life: hopping freight trains, getting hit by lightning, performing his banned play in Czechoslovakia, growing up in Minnesota, and eating things before knowing what they are. Kevin Kling describes his zodiac sign as “Minnesota with Iowa rising…” He grew up in Brooklyn Park and Maple Grove, Minneapolis suburbs, and graduated from Gustavus Adolphus College in 1979 with a Bachelor of Arts degree in theater. His storytelling started when a friend from the now defunct Brass Tacks Theatre asked him to perform his stories. Since then, he has been awarded numerous arts grants and fellowships. The National Endowment for the Arts, The McKnight Foundation, The Minnesota State Arts Board, The Bush Foundation, The Jerome Foundation and others have recognized Kling’s artistry. In 2014 Mayor RT Rybak named Kling “Minneapolis Story Laureate”. Kevin was born with a congenital birth defect — his left arm is about three-quarters the size of his right arm, and his left hand has no wrist or thumb In 2001 Kevin was in a motorcycle accident and suffered brachial plexus injury (BPI). The brachial plexus nerves in his right arm were pulled completely out of their sockets. Currently, he has partial use of his left arm and cannot use his right arm at all. 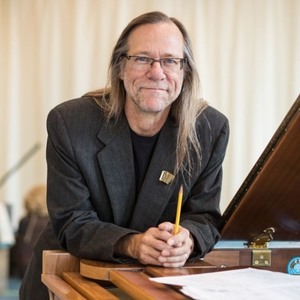 Kevin Kling continues to write plays and stories in a rigorous fashion, and travels around the globe to numerous storytelling festivals, residencies, and has been invited to perform the acclaimed National Storytelling Festival in Jonesborough, TN for several years. Kevin has released a number of compact disc collections of his stories, has published five books, “The Dog Says How”, “Holiday Inn”, “Big Little Brother”, “Big Little Mother” and “On Stage with Kevin Kling.” His plays and adaptations have been performed around the world. He lives in Minneapolis. Victor Zupanc, born in Canada, began his musical career studying violin and piano at the age of six at the Royal Conservatory of Music in Victoria, British Columbia. After receiving his Bachelor of Music Degree at the University of Victoria he earned his Masters Degree in Music Composition at University of California at San Diego in 1983. Since 1983 Mr. Zupanc has been involved in over 300 theatrical productions as composer, musical director, sound designer and performer. He has worked at some of the most respected theaters in the country including The La Jolla Playhouse, San Diego Rep, Missouri Rep, The Kennedy Center, Berkeley Rep, The Brooklyn Academy of Music, The Joyce Theater, SITI Company, Playwright's Horizons, The Acting Company and New Victory Theater; in Minneapolis, The Guthrie Theater, Theatre de la Jeune Lune, The Jungle Theatre and The Mixed Blood Theater. His music has been heard abroad in China, Japan, South America, Great Britain, Spain, France, Australia, New Zealand and Canada. Artists that Mr. Zupanc has worked with include Des McAnuff, Robert Woodruff, Ann Bogart, Marion McClinton, Nilo Cruz, Graciela Daniele, Kevin Kling, Bill Irwin, Stephen Sondheim, Randy Newman and David Byrne. Mr. Zupanc is a two time recipient of The Theater Critics Circle Award for his theater scores (A Man's A Man, director: Robert Woodruff and Nineteen Fifty One, director: Ann Bogart) and was twice awarded with a Hollywood DramaLogue Award for his work, most notably for the acclaimed New York production of Romulus Linney's Holy Ghost! In 1989 he accepted and still retains the position of Music Director/Composer at the Tony Award winning Children's Theater Company of Minneapolis (CTC). At CTC, Mr. Zupanc composes scores and conducts orchestras comprised of the finest professional musicians in the country. Zeitgeist has maintained a fierce dedication to the creation of new music for the past three decades, commissioning more than 400 works and collaborating with emerging composers and some of the finest established composers of our time, including Frederic Rzewski, Terry Riley, John Cage, Pauline Oliveros, Paul Dresher, Mark Applebaum, Arthur Kreiger, Scott Lindroth, Pamela Madsen, Edie Hill, Libby Larsen, John Luther Adams, Jin Hi Kim, Mary Ellen Childs, Martin Bresnick, Harold Budd, La Monte Young, Guy Klucevsek, and Chinary Ung. Zeitgeist’s upcoming commissioning projects include new works by Mary Ellen Childs, Davu Seru, Andrew Rindfleisch, and Pamela Z. Further, Zeitgeist has earned an international reputation for superb craftsmanship, virtuosic performance, and an innovative approach to the presentation of contemporary music. Highlights include Sound Stage by Paul Dresher (2001), a music-theater work featuring Zeitgeist and a 17-foot high musical pendulum, Walker Art Center premieres of Pine Eyes by Martin Bresnick (2006) and The Making of Americans by Anthony Gatto and Jay Scheib (2008), a 30th anniversary celebration (2008) Glancing Back/Charging Forward: 30 Years of Groundbreaking Musicfeaturing the world premieres of works by 30 Minnesota composers, For the Birds (2010), an evening-length chamber suite with narration by composer Victor Zupanc and humorist Kevin Kling, the premiere of Spiral XIV “Nimmitta” (2012) by Cambodian American composer Chinary Ung, and Saint Paul Food Opera (2016), a dining and music collaboration between composer Ben Houge and five Saint Paul chefs. Upcoming collaborations include Crocus Hill: A Ghost Story, a macabre tale of a house possessed brought to life with chamber music, narration, and video, by composer Julie Johnson and author Cheri Johnson. This event is non-ticketed, free, and open to the public.